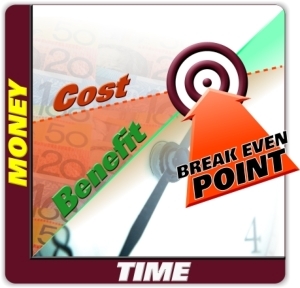 One of the criteria used to determine the feasibility of a project is the Break Even Point - the point in time where the income (benefit) is greater than the expenditure (cost). For Project Management - Cost Benefit Analysis is a database application that allows you to enter the costs, benefits and respective values of a project and to display the results in a graphical and tabular format. While simple cost-benefit analysis can be easily created using a spreadsheet, For Project Management - Cost Benefit Analysis allows for the entry of periodic payments or units as well as fixed one-off amounts. This application helps assist in the analysis of projects and can be further customised according to your requirements. Please feel free to contact us, we would appreciate hearing from you.